About forty years ago a large rock music festival was held in Woodstock, NY. This was followed by similar rock music festivals in several states including Connecticut. At most of these festivals the promoters provided bands for entertainment, but nothing more. The festivals were often held on a temporary stage constructed in an open field with no provision for food, water or sanitary facilities. Connecticut, along with other states, responded by enacting "mass gathering" laws to control these music festivals and ensure that they met basic sanitary and safety requirements. The Connecticut mass gathering law applied only to events that lasted for more than 18 hours in any one day and attracted more than 3,000 people. Those laws were revised last year to remove provisions that are now obsolete, such as requiring pay phones based on the number of people expected to attend the event, but they have also been revised so that they now impact many of our agricultural fairs. The Mass Gathering law now applies to any event that will attract 2,000 or more people and will last for more than 12 hours in any one day. Most of our larger fairs are open for more than 12 hours on one or two days, so they will have to comply with all the requirements of the law. This could cost the fairs enough that they may have to reduce their hours to continue being exempt from the law. The towns where the fairs are held will be required to provide the required inspection services, which could require them to hire additional town employees for the weekend of the fair. The towns could pass this costs along to the fair in the form of inspection and permit fees, but where would the towns find enough people with the required qualifications to perform the inspections? The Association of Connecticut Fairs is working to have the Connecticut Mass Gathering Law revised to exempt the agricultural fairs. A letter has been sent to all the fairs, including the smaller Grange fairs, asking them to contact their senators and representatives to seek their support in revising the mass gathering law, even though it does not affect the smallest fairs. As word of this situation is spreading, other groups are becoming concerned about further changes in the law so that it would impact not only the smaller Grange fairs but also other local events such as strawberry festivals, heritage festivals and even Independence Day celebrations that run all day and conclude with fireworks after dark. 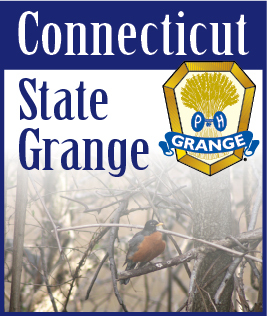 At present, 17 Subordinate Granges sponsor fairs that are members of the Association of Connecticut Fairs and a few other Granges sponsor fairs that have not joined the Association of Connecticut Fairs. This is about one third of our Granges in Connecticut. Now the fairs need help from all the Granges and their members. Please call, write or send an electronic message to your local State Representative and State Senator asking them to support changes in the Mass Gatherings Law, Public Act 09-232, that will make the agricultural fairs exempt from this law. If you prefer, ask them to support total repeal of this law. A formal bill has yet to be drafted, but this is a year when the General Assembly is meeting in a short session. Everything happens very fast, so we cannot wait to contact our legislators. Please contact me if you need any talking points as I am also Legislative Chair for the Association of Connecticut Fairs. A bill has been filed to require seat belts on all school buses by January 1, 2011. This bill was filed primarily in response to the recent accident in Hartford where a school bus was involved in an accident and went down an embankment off I-84, killing one student and seriously injuring others. There are equally strong proponents and opponents for and against this bill, but the bill needs a lot of work if it is to become an effective law. The major problem is who will insure the children wear their seat belts and help the younger ones get their belts fastened and unfastened. If the bus driver has to leave his seat to do this, many other safety problems arise. If every bus has to have another person to look after the seat belts there will be significant additional costs to the towns. If each stop takes longer while the children are fastening or unfastening their seat belts, each trip will take more time. The only solutions to this problem are to stagger the school opening and closing times more than they are now or add more buses. The Grange has never taken a position on seat belts on school buses, so I will not be testifying either way on this bill.